My first experience with Guillermo del Toro was The Devil’s Backbone, an affecting Spanish-language ghost story from 2001 set during the Spanish Civil War, and a thematic precursor to the director’s 2006 masterpiece Pan’s Labyrinth. I was amazed by how in both pictures the director twisted my emotional involvement in the story to support the more fantastical, frightening elements therein, orchestrating the two reactions in unison to make a lovely interplay we can rarely expect from that genre. Indeed, Del Toro’s greatest strength is the surprising depth he incorporates into his narratives, be they stark wartime depictions laden with supernatural escapism, or pulp superhero yarns. 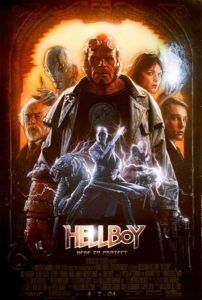 Hellboy belongs in the latter category, and while the film probably won’t involve you on the grand emotional level the aforementioned pictures might, you’ll find yourself entertained by one of the most satisfying superhero films ever made. The experience rewards with palpable craft embedded into each facet from character development to special effects. 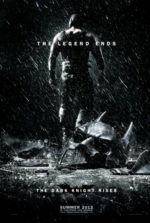 It’s treated like a majestic opus by a master filmmaker, with every detail calculated, deliberate, and labored over, stockpiling remarkable artistry into every scene. 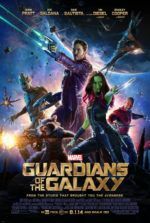 The story begins in 1944, where an American military unit under advisement of the President’s paranormal adviser, the young Professor Trevor “Broom” Bruttenholm (Kevin Trainor), fights to stop Grigori Rasputin (Karel Roden)—yes, that Rasputin—from releasing the monstrous Seven Gods of Chaos, marking—you guessed it—the end of the known world. Backed by occultist Nazis, Rasputin clamps-on gizmos galore while Hitler’s goons circle a perimeter; metallic blue ethereal energies begin to flare, unknown machines oscillate, and suddenly a fissure into somewhere opens up. Thank goodness for the Americans, who sweep in and thwart Rasputin’s plans, sending the villainesque figure dripping into his own gateway. And though the portal closes, Broom finds something got through: a red, ape-like devil-child with a sweet disposition. He affectionately names the creature Hellboy. Cut to present day, to a nightmarish version of The X-Files where the titular FBI Agents are replaced with the very monsters they’re hunting. A much older Broom (now played by John Hurt) commands a paranormal duo fronted by toughguy Hellboy (Ron Perlman) and psychic humanoid creature from the primordial lagoon, Abe Sapien (voiced by David Hyde Pierce, body by Doug Jones). They’re all kept ultra-secret by government stooge Manning (Jeffrey Tambor) for a singular purpose, as Broom explains in a most succinct description of their duties: “There are things that go bump in the night. Make no mistake about that. And we are the ones who bump back.” We’re introduced to this bizarre world of myths and horrors-come-true by the naïve Agent John Myers (Rupert Evans), hand-picked from the academy to replace the dying Broom. Little did Myers know he would be serving five-gallon bowls of chili to a ripped devil-man with an attitude. Despite his size and appearance, Hellboy shouldn’t be misconstrued by his name. He’s a working stiff just like you and me, only he’s locked away from public view in a secret underground facility at the Bureau of Paranormal Research & Defense. Besides that, Red, as they call him, enjoys beer and nachos, has an affinity for cats (as pets, not food), smokes cigars, and dishes out one-liners like any action hero. He’s even self-conscious about his appearance, grinding his massive horns down to flat nubs in order to “fit in.” Granted, his massive right arm of stone and yellow eyes don’t bode well for his normality, but he’s human at heart. Hellboy is even in love with ex-teammate Liz Sherman (Selma Blair), a firestarter struggling to control and understand her abilities. He periodically breaks out of the BPRD fortress to pay her a visit, talk, and feel normal. There’s an aspect of tragedy here, because Hellboy will never be normal. Indeed, his “destiny” resides in (re)opening Rasputin’s portal with his big stone hand. And as Red’s love life goes, Meyers seems more suitable for Liz, who returns to the bureau after Rasputin reemerges from death yet again. Looking to free those evil Lovecraftian gods from their crystal prison, Rasputin unleashes slimy, tendril-hearty monsters called Sammael to occupy Hellboy and the gang. Accompanied by immortal Nazi sidekicks like the surgery-addicted, blade-wielding assassin Kroenen, Rasputin moves in and out of shadows, playing Hellboy like a puppet. Our hero is apparently fated to be a tool of evil. And yet, how could someone so chummy be wicked? 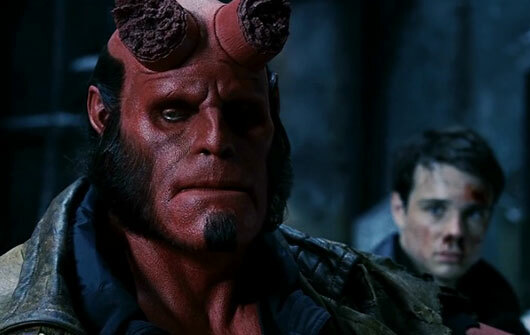 Based on the Dark Horse Comics character created by Mike Mignola, Hellboy’s world of monsters and superheroes finds Guillermo Del Toro right at home. The idea, aligning perfectly with the director’s reoccurring themes, is a novel one: monsters investigating monsters, because who else could understand them so well? But rather than emulating Mignola’s comic page, Del Toro, who also wrote the film’s script, uses Mignola’s source material as a springboard for an emotionally viable story. For example, Del Toro develops Liz and Hellboy’s rather obvious mutual love, which Mignola never considered in his books. The director also invented the character Meyers as an audience-friendly entry point into Mignola’s admittedly pulpy, uncanny world. Creating that world is a combination of tangible and computer-generated effects, with an emphasis on raw makeup, prosthetic, and puppet work. Designed by Del Toro and his staff of artisans, every creature pops with corporeal substance, saving us from the standardized and normally CGI-riddled Hollywood comic book movie. 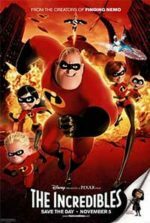 From set design to visual effects, the entire film resonates with a pulse, and upon first look, immediately distinguishes itself from others in the comic-to-film genre. Those effects are put to their most pronounced use on the title character. Usually hidden behind paint and prosthetics, who better to play Hellboy than Ron Perlman, best known for his popular turn in TV’s Beauty and the Beast? His character’s blue-collar persona finds pitch-perfect intelligibility thanks to the actor’s apparent ease under inches of red makeup. Massively sized in body and personality, Perlman’s performance contains lively, seemingly effortless displays of emotional clarity in spite of his otherwise concealing, expression-restricting makeup. And being that Perlman is a Del Toro favorite—the director used the actor in Cronos and Blade II—his placement here is nothing less than binding to the film’s presentation and success. The same can be said for Doug Jones, another from Del Toro’s troupe, who’s identifiable as the unfathomably skeletal body behind those skinny monsters throughout the director’s filmography. 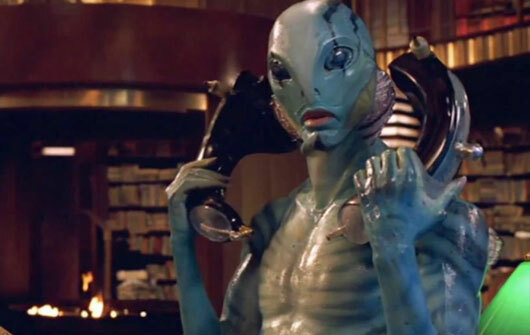 Playing Abe Sapien, a character that lives and breathes without the assistance of a computer program illustrating it to do so, Jones places another fleshlike body before us, tempting viewers to reach out and touch. Like his costar Perlman, the actor endured hours in a makeup chair to construct his façade; both performers enhance their already stark appearance with undeniable personality. Jones also appeared in Pan’s Labyrinth as the Pale Man and the title’s faun, suggesting theatrical airs with his movements that strangely agree with the other-worldly origins of his characters. He’s an actor that, despite his voice being replaced with Hyde Pierce’s, exudes the essence of his characters with body language. Every component of Hellboy shows signs of lavish attention because the visionary mind of Guillermo del Toro leaves no surface unpolished. And while upon the film’s initial release I might not have given as glowing a review as I have here, I can only explain that through repeated viewings the details emerge. Colors and backgrounds burst, glowing special effects remain secondary to story, and evident craftsmanship constructs the comic book reality. The characters, we realize, are genuine and lifelike—and considering most of them are impossible creatures born from pure imagination, their authenticity, thanks to Del Toro, is all the more impressive.